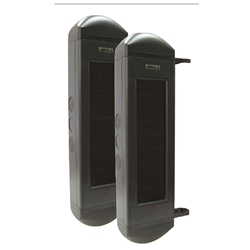 The BBT-2500 is a solar powered wireless infrared break beam sensor that is simple to install and requires no wiring. The break beam sensors are powered by lithium ion batteries that are recharged through the solar panels during the day. Because the unit is self powered there is no need to run wires for power. Installation time can be as little as a few minutes. The infrared sensing terminals can be mounted up to 300 feet apart and will send a signal back to the DCR-2500 receiver up to half mile away anytime someone passes between the sensors. The break beam sensor is a point to point sensor and will not be activated by any motion outside of the monitored beam. The sensors are not affected by small objects such as falling leaves or birds. It can be mounted high enough to avoid dogs and other animals but it will detect any intruder walking through the beam area. The beam sensor is ideal for outdoor applications such as storage lots, lumber yards, car dealerships, etc. Multiple sensor pairs can be used to send a signal to one receiver if you wish to set up a perimeter.